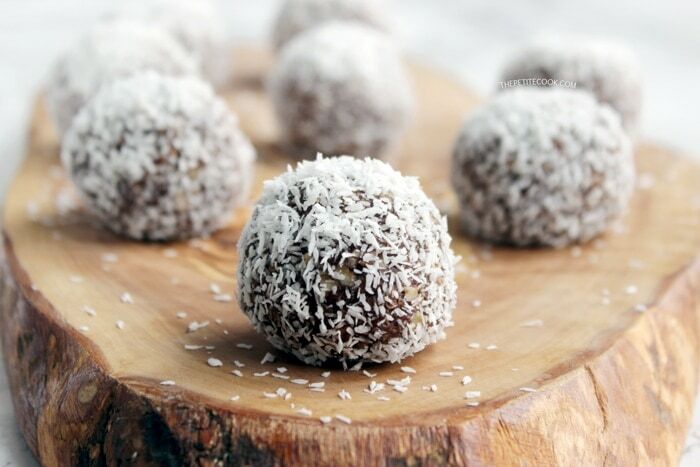 These Swedish Chocolate balls (chokladbollar) are a super popular and traditional sweet treat, featured here in a delicious gluten-free and vegan version. 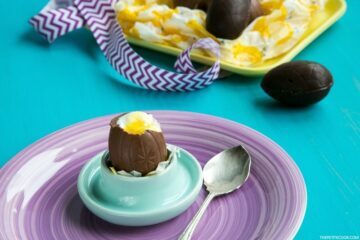 The perfect bite-sized treat to satisfy your chocolate cravings! I discovered these chocolate balls while on holiday in Gothenburg a few years ago. These delicious chocolate balls won my heart at the very first bite. They’re SO addicting. Once you try them it takes a lot of self-control to stop. These Swedish chocolate balls don’t require any cooking or baking, and are ready in 15 minutes only. 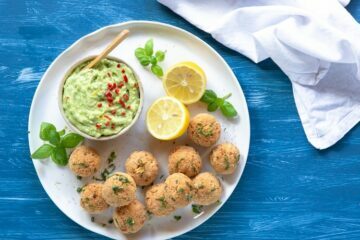 Made with simple ingredients you most probably have in your pantry already, those little balls are impressively easy to put together. 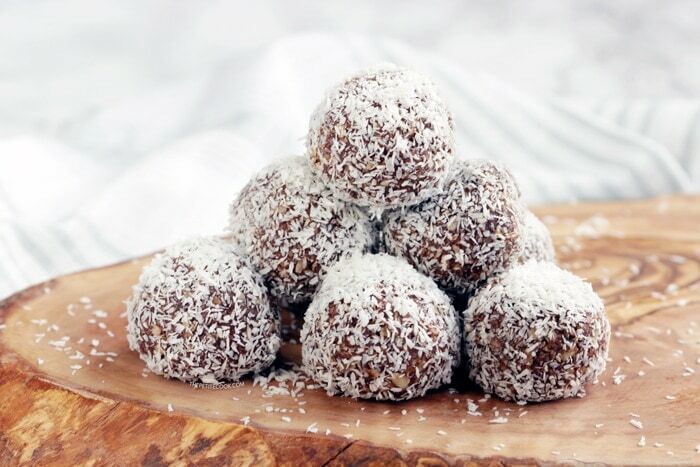 The best part is, these Swedish chocolate balls are totally no-bake, dairy-free, gluten-free, vegan, soy-free and anything else you can think of. Traditional Swedish chocolate balls are made with oatmeal, sugar, vanilla sugar, cocoa, butter, and a small amount of coffee. 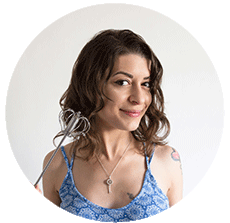 You can stick to the traditional recipe or make some tiny changes to turn them into an allergy-friendly healthier treat, like I did. Replace butter with coconut oil using the same ratio, and swap regular sugar for fine organic muscovado ( try also with maple syrup). The flavour is so similar you won’t taste the difference, and they become conveniently vegan, making everyone happy. 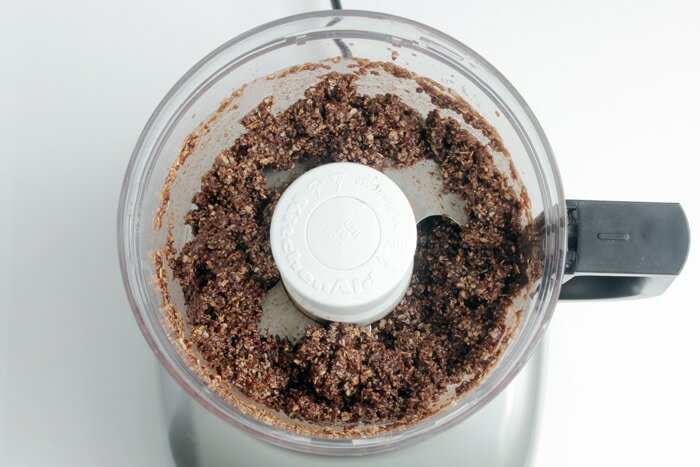 Fold all the ingredients in a food processor and mix for 30 sec or until combined. Scrap down the mixture with a spatula if necessary. The mixture should be easy to roll and not too sticky, feel free to adjust the consistency with more oats or coffee. To give it a fun grown-up twist, you can also substitute coffee with spirits like Kahlua, Baileys or rhum. I promise these chocolate balls will be a hit! Usually kokosballs are the the size of a golf ball, but you can shape them in the size you prefer. I go for a bite-sized version, but I’ve in seen shops in Sweden selling chocoballs the size of a baseball (!!). Once ready, roll them in coconut flakes. These treats are already very sweet, so I use unsweetened dessicated coconut flakes. But you can also use pearl sugar or finely chopped nuts like pistachio, almonds or hazelnuts. This recipe as you can see, is super simple and really fun to make. 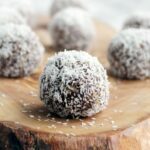 Ask your kids to help you out, or invite your friends over and have a great time recreating these awesome Swedish chocolate balls together. They also make a super cute homemade gift for any occasion, from Halloween to Christmas, or offered as wedding/birthday party favours. These magic Swedish chocolate balls are a great addition to breakfast or tea time, especially now that the days are getting chiller. 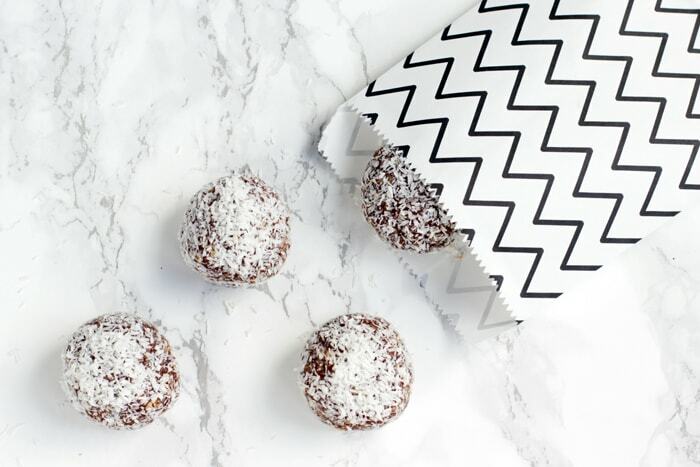 I can already see myself holding a cup of nice cup of coffee ( as the Swedish tradition wants) and indulge into this secretly healthy delicious treat! 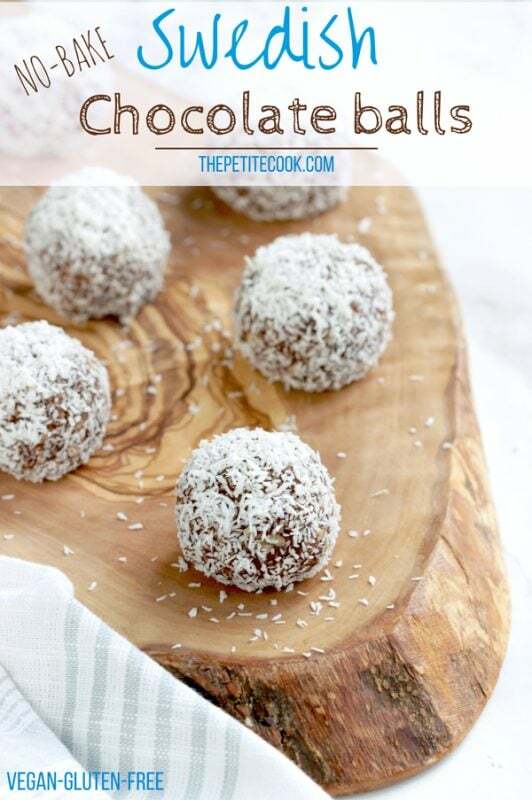 I really really hope you’re gonna give these yummy Swedish chocolate balls a try, they’re so incredibly quick and easy to prepare, and SO satisfying! 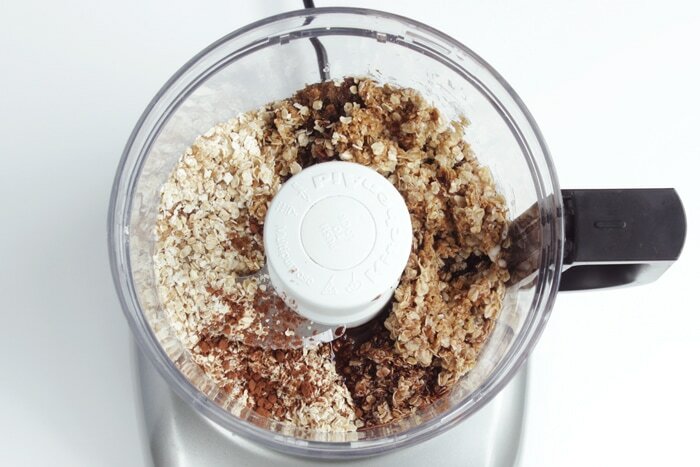 Fold all the ingredients in a powerful food processor and mix until combined. The mixture should be easy to roll and not too sticky, you can adjust consistency with oats or coffee. 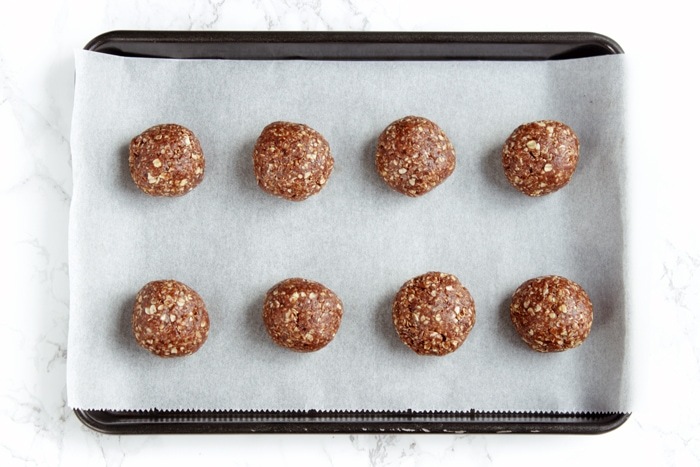 Shape the mixture to form bite-sized balls and arrange on a tray covered with parchment. 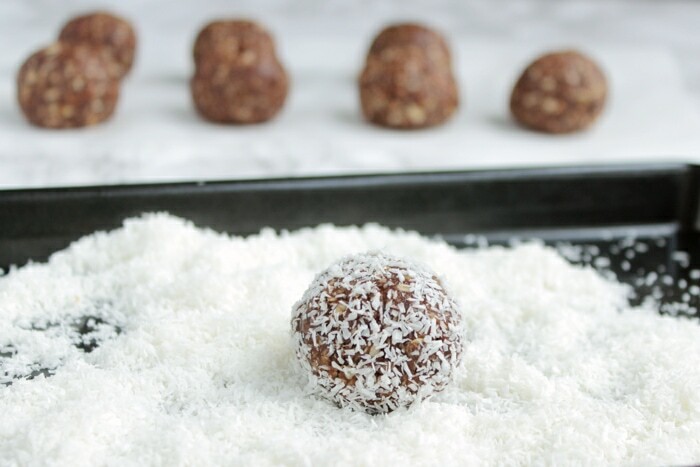 Roll each ball over coconut flakes, refrigerate for 10 min and serve. To make sure your Swedish chocolate balls are gluten-free, use only non-contaminated, certified gluten-free oats. This post was originally published in 2015 and updated with new info. Did you try this recipe? Tag @thepetitecook or use the hashtag #thepetitecook - Looking at your pictures makes my day! If the oats has only been milled in a mill which has never seen any other grains then it can be considered gluten free. Otherwise, the chances of cross contamination is really high. Many mills will roll oats and other grains as a means of profit. I have also found farmers are not always careful with weeding out volunteer grains and then take Oats and other seeds to milling. Do you think they’d hold up with olive oil instead of butter? And for the vanilla sugar can I use vanilla + sugar? Thanks! 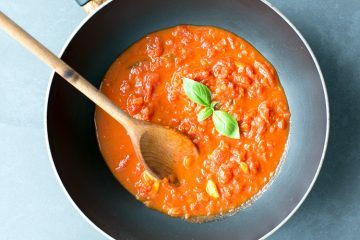 I usually go for coconut oil, so I’m not sure how they will turn up with olive oil, if you use it opt for a very light oil. As stated in the recipe, I use vanilla bean + sugar, vanilla extract will work well too :).